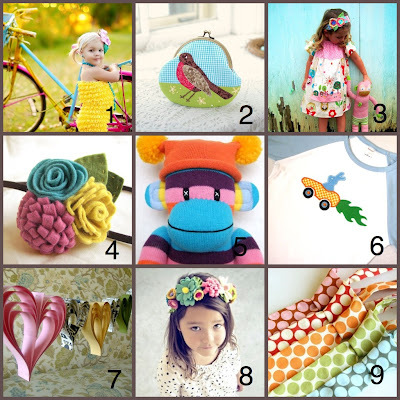 Modern Handmade Child: Friday Finds: Bring on Spring! Who's ready for Spring? Well, we have good news for you: the Spring Equinox starts March 20 at 7:21pm Eastern Standard Time. And we couldn't be more excited! It's not just the heavenly weather that comes with Spring, or the new blooms in the backyard. Spring is truly a state of mind. So bring on the color. Bring on the ruffles. Bring on the flowers, polka dots & birds. And now let us celebrate these lovely handmade artists that will help us bring on Spring!